For kids and their carers that like fishing, this is an interesting place to go to, whether you make a special trip to get there or stop on a road trip along SH1. 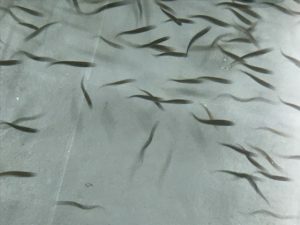 The centre is home to the national trout hatchery and spotting these fish from their tiny baby stage through to fully grown adults is definitely part of the experience. Kids of all ages will be able to see fish either inside in tanks (not just trout but other species too!) or the older trout outside in the stream and children’s pond. Pick up a tub of fish food (large so easily shared between more than one child) and there are lots of opportunities to feed the trout that are outside. The walk along the stream is very pleasant going through native bush. The viewing chamber is a good place to try and feed the fish and watch them dive after the pellets – you just need to master the art of flicking it over the wall first! The children’s pond is another good place to see and feed the fish. Can you make them jump for their food? There are kids fishing days here where you’re almost guaranteed to catch your dinner! These happen several times a year, timed to coincide with school holidays. Check for dates here and make sure you book in advance as they usually sell out. 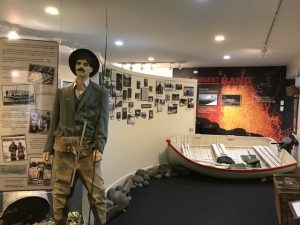 From here you can walk down to the Tongariro River and see keen fishermen at work before returning to the centre. This activity is partly outdoors and you could extend this by taking food with you to have as a picnic under one of the big old trees near the children’s pond. If the weather isn’t that great though, the bush along the stream does provide some shelter and with a raincoat it’s still a place you can have fun. 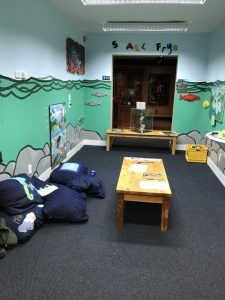 There’s also the inside section to the centre which, as well as the hatchery, also contains a museum with lots of historic fishing paraphernalia to look at! There’s also a kids’ room with books and floor cushions which you could easily spend time in if you were waiting for a rain shower to pass. Outside kids that are likely to wonder off will need to be carefully supervised as the waterways (stream, pond and river) aren’t fenced at all. Address: SH1 Turangi. The centre is about 4km south of Turangi on the main road with car parking onsite. Open: daily 10am – 3pm winter (beginning May – end of November) and till 4pm summer (end of April – beginning of December). Closed Good Friday, ANZAC Day (25th April) and Christmas Day. Price: Adults $15, Kids (under 16) Free but must be accompanied by a paying adult. Fish food is extra.